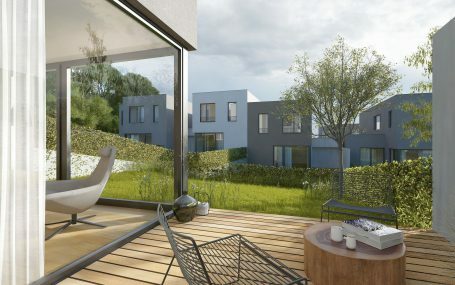 Avestus Real Estate, developer of the successful residential project Modřanský Háj, has announced it will significantly expand housing in this attractive location of Modřany, Prague 12 by 170 new units, comprising 1+kk to 4+1 flats, family houses and plots with complete infrastructure. Construction of some of these units is already underway, while the next phase of construction will begin next year. Modřanský Háj is one of the fastest growing residential projects in Prague. Its popularity is attributed to its premium location in the immediate vicinity of nature and easy accessibility to the city centre. It offers a calm and safe environment for families, great amenities and a variety of sports facilities. A unique combination of timeless architecture surrounded by the greenery of private gardens and Modřanská rokle creates an almost rural-like atmosphere that has long been popular with clients. Currently, the construction of 16 family units ranging from 4+kk to 5+1 with total floor areas ranging from 137 to 193 square metres is underway. Future residents can look forward to their own gardens, terraces as well as the comfort of private parking spaces. Houses are already on sale with prices starting from 9,550,000 CZK, including the plots. For those wanting to build a home according to their own vision, 17 plots are available for custom construction with complete infrastructure on land areas ranging from 633 to 1,906 square metres. Prices start at just below 7,280,000 CZK. The expansion of Modřanský Háj will continue in the year to follow, though the new units are available for purchase as of now. The construction will include 70 flats in building A, and 56 flats in buildings C and D. The flats range from 1+kk to 4+kk and they will be available at prices starting from approximately 2,480,000 CZK. They will feature private balconies or terraces, and some with gardens or roof gardens. Parking space in underground garages can be also purchased. The other eight spacious units of 4+kk and 4+1 with floor areas starting from 115 square metres will be part of building E. Private and roof gardens, terraces and balconies as well as underground parking spaces will be provided at a cost starting at about 9,000,000 CZK. 2018 will mark beginning of the construction of five semi-detached villas of 5+1 and with floor areas starting from 193 square metres. Gardens, terraces and two parking spaces are included in the price, which will start from 12,920,000 CZK. Premium comfort will be provided by three villas in the 5+1 layout providing the experience of exclusive residential living on an area of more than 282 square metres, with a large garden, terrace and two parking spaces in the garage at a price starting approximately from 18,810,000 CZK. The construction of Modřanský Háj began in 2010 according to the design of A69-architekti s.r.o. studio. At present, there are seven apartment buildings. In addition to 16 family houses, six more apartment blocks and two semi-detached villas are in construction. The project is conceived as a low-rise development, with most buildings having a maximum of three storeys.